Transhuman is a four-issue science fiction comic book mini-series written by Jonathan Hickman, with art by J.M. Ringuet, published by Image Comics. It was collected into a trade paperback in January 2009. Transhuman is a story about genetic engineering in humans told in the style of a mockumentary. Think This Is Spinal Tap, but not hilarious. Although a certain dark humor is apparent throughout, Transhuman takes a more serious tone as narrator Heinrich Dowidat guides readers through the story of two corporations racing to upgrade Humans to Posthumans. Along the way Heinrich gets first-hand accounts from the scientists, the suits, and test subjects that were involved in the genetic enhancement projects. Ultimately, Transhuman is a story about people, their ambitions, their hidden agendas, their politics, their spite, and their greed. It’s about capitalism. 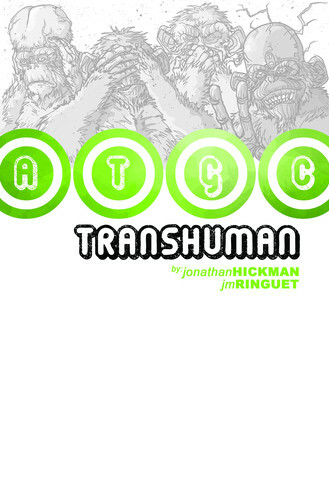 Transhuman, just as Jonathan Hickman’s other works, blew my mind. Though beautifully illustrated by J.M. Ringuet, the book also features several of the signature layouts that Hickman’s books are famous for. Just as is the case with The Nightly News and the unfortunately scheduled A Red Mass For Mars, I can’t recommend Transhuman highly enough.